Carbon Monoxide (CO) is a highly poisonous and produced by the incomplete burning of gas and Liquid Petroleum Gas (LPG). This happens when a gas appliance has been incorrectly fitted, badly repaired or poorly maintained or if flues, chimneys or vents are blocked. Oil and solid fuels, such as coal, wood, petrol and oil can also produce Carbon Monoxide. Carbon Monoxide symptoms include headaches, dizziness, nausea, breathlessness, collapse and loss of consciousness. Photograph is an indicative only. Carbon Monoxide (CO) alarms protect residents by giving an early warning when the poisonous gas is detected in the home. 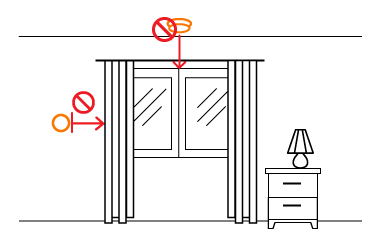 Installing a CO alarm is a simple DIY task, with most detectors only requiring a couple of screws, while some are free-standing and require no installation. Ideally the alarms should be installed next to potential sources or CO in the premises and in sleeping areas. 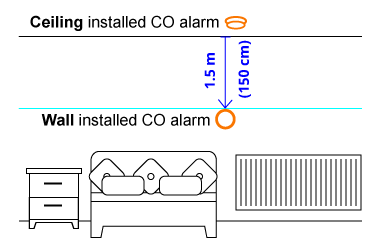 The alarms should be at a horizontal distance of between 1.5 metres from the ceiling if fitted on a wall. Avoid putting them too close to windows or air vents. People suffering from Carbon Monoxide poisoning should get fresh air immediately, open doors and windows, turn off gas appliances or extinguish other sources, leave the house and see a doctor.